On Wednesday 4th June 2014 Team MUGEN firmly recorded another fine victory into the record books of the company history. 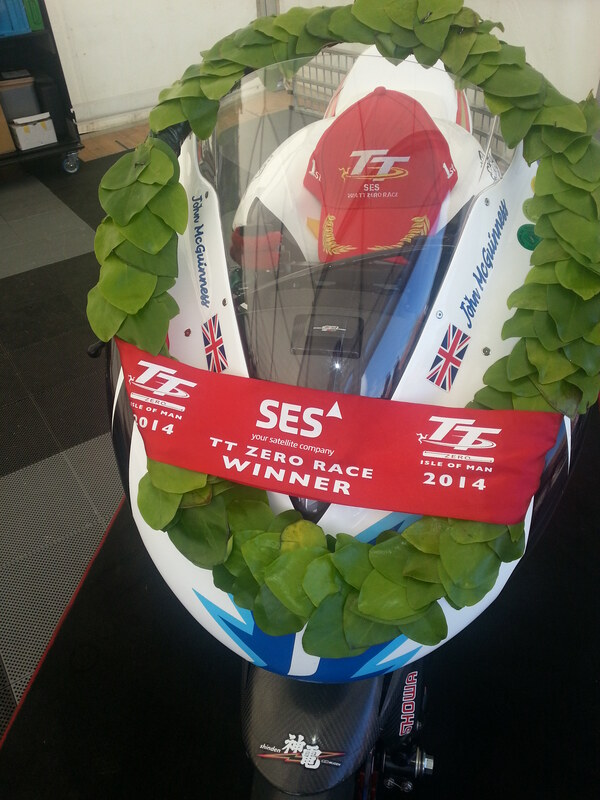 Competing with the all-electric racing bike, Shinden san, the third iteration of the TT racer produced by M-Tec Co Ltd (M-Tec), and named after the Japanese God of Electricity, the team scored a victory in the SES TT Zero class (for motorbikes producing zero emissions) with record-breaking pace at the 2014 Isle of Man TT race event. Throughout practice and qualifying Shinden san was the class of the field, beating the previous lap record from2013 with every completed lap, including the first sub-20 minute lap by and electric bike, but saved the best for the race itself. Having been narrowly beaten into 2nd place in 2013 (by 1.6 seconds) M-Tec were determined to maximise the performance of Shinden san which entailed revised aerodynamics and bodywork, more powerful and lighter motor, improved battery capacity, and the latest Showa factory suspension. Boasting specs including 100KW power (approx. 134hp) and 220Nm torque Shinden san arrived in the UK after impressing in testing in Japan, and continued to raise eyebrows with its performance in its UK testing at Castle Combe circuit, after which the bikes and team set off for the Isle of Man. Pre-event testing was borne out in the first practice on the famous Isle of Man Mountain Course, immediately easily breaking the previous lap record, and recording an incredible speed at the Sulby Straight speed trap of 164.9mph . 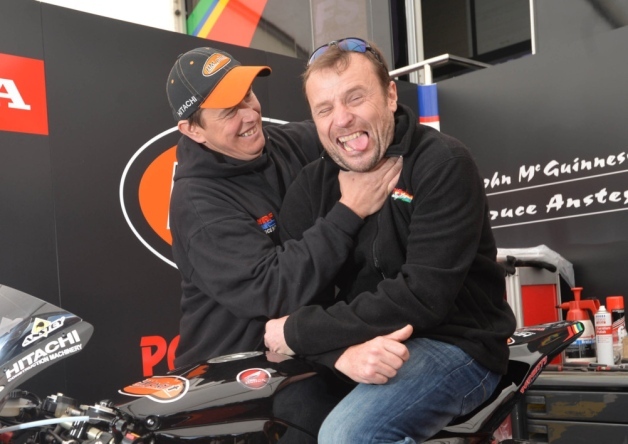 For 2014 Team MUGEN had elected to run 2 riders for the first time, with previous Team MUGEN rider, 20 times TT winner John McGuinness joined by long-time fellow competitor 9-time TT winner, Bruce Anstey, enabling the team to be able to collect double the data from previous years and to run different practice strategies for comparison. With Anstey having to abort his first practice lap early due to a mechanical failure, McGuinness gained the upper hand on day One. 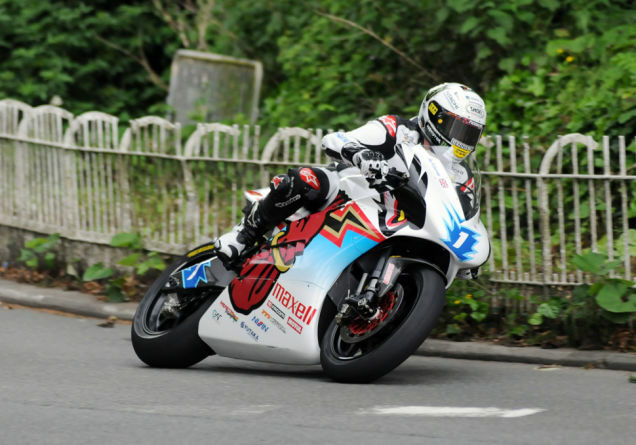 However Anstey was proving himself to be on fine form with his other (petrol) bikes, which included setting an outright official lap record for the IoM of over 132mph with his Padgetts Racing Superbike (traditionally lap records at the IoM TT are reported in average speed rather than time), and in TT Zero qualifying session 1 regained the edge over McGuinness with yet another (unofficial) lap record of over 113mph. Not to be outdone, in Q2 McGuinness hit back with a best qualifying speed of 115.6mph. With the nearest non-MUGEN runners qualifying well behind the 2 Shinden san machines Team MUGEN were strongly tipped as race favourites, but observers were split over which rider would prevail – Anstey with his relative inexperience with electric bike racing, but in otherwise excellent form, or McGuinness with his 2 years (+ 1 lap!) greater experience with electric machinery, but who was riding injured having recently suffered a fractured scaphoid in training. Come race day the Shinden sans were widely expected to run away from the rest of the field but in racing, particularly on the longest, and one of the most arduous, courses in the world, nothing can be taken for granted and the Shindens would need to conquer the gruelling 37.73 miles. Starting from first position on the road McGuinness, traditionally a very fast starter got away well, and Anstey starting from 4th on the road (IoM TT is a time trial format with each rider starting 10 seconds behind the previous) quickly overtook the 2 bikes between him and his team-mate and set off in pursuit. But on this day McGuinness was not to be denied, and from a gap of just under 5 seconds at the first checkpoint he steadily increased his lead, crossing the line to earn his 21st TT victory at almost 140mph to record a lap record time of 19 minutes 17.3 seconds, an incredible average speed of 117.366 miles per hour, beating the previous record by over 7.5mph and 1 minute 20 seconds. Anstey followed home with a 115.048mph lap of his own to complete a fine EV debut in 2nd place and giving Team MUGEN a 1-2 finish and establishing a legacy for MUGEN in TT history. 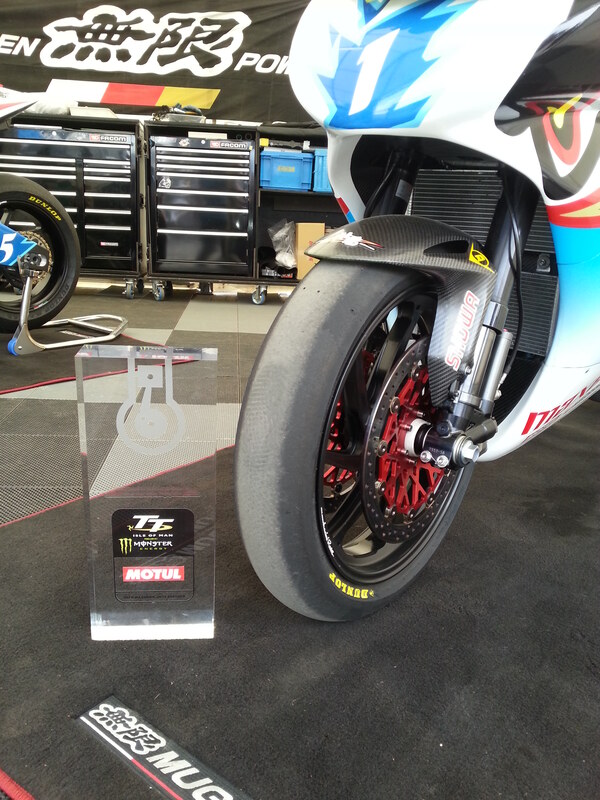 As an added bonus Shinden san was also awarded the MOTUL Technical Achievement trophy for its record-breaking performances.